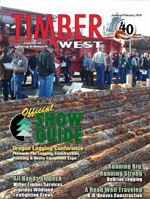 Jerry DeBriae, owner and founder of Jerry DeBriae Logging Inc. of Cathlamet, Washington, has over five decades of experience tackling just about every challenge a logging contractor will face. R D Reeves Construction finds the solutions to stay diversified and local. China aims to increase the volume of timber imports from the U.S. despite stagnant economy. Carruth, who holds a BSF from Virginia Tech and an MSF from West Virginia University, has extensive industry experience: Procurement Forester (Westvaco), Harvesting Research Project Leader (Westvaco), Wood Flow and Administrative Supervisor (MeadWestvaco), and Operations Manager (KapStone Charleston Kraft). The Northwest agriculture, forest products, and fisheries industries enter 2016 with different outlooks, according to industry analysts at Northwest Farm Credit Services. The forest products industry continues to experience a lethargic, but sustained, recovery as demand improves, supported by employment and household formation increases. Demand improvements are met with increasing lumber supplies from the U.S. and Canadian imports. Overall, results for forest products companies in 2015 are below 2014 performances.